While we wear identifying patches or regalia, the Widows Sons are not a gang, MC, 1% Club. We are required to represent the fraternity in a positive light at all times. The Widows Sons serve as a Masonic Booster Club by helping to raise Masonic Awareness while we attend public motorcycling events, and by supporting our Blue Lodges in whatever capacity we are able. Widows Sons chapters have helped to increase Masonic membership through our presence and visibility during public motorcycle events and rallies. In every location where we have a chapter, the Widows Sons have proven themselves to be a positive asset to the fraternity. Many of the Widows Sons chapters are proud to have current and past Grand Masters as members. We regularly attract new members to the fraternity, and several chapters have their own Degree Teams or volunteer in doing Masonic work whenever possible. Across the world, each Widows Sons chapter sponsors or participates in local charity runs or events. In all cases, we strive to present a positive image of Freemasonry and our Association to the public. 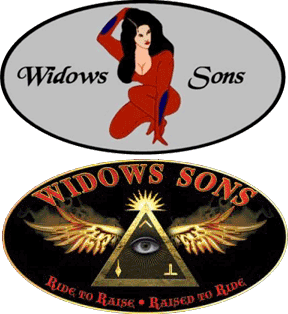 The Widows Sons was conceived of and founded by Brother Carl Davenport PM, in the year 1999. Today we have active chapters throughout many States in the USA, Canada, and abroad. If you are interested in joining the Widows Sons, we would be happy to hear from you. Widows Sons Masonic Riders Association of New Jersey is a registered 501(c)3 organization.